Having said that, it wasn’t as if I had been eagerly awaiting that snowy February weekend in the slightest. Sure, give me any chance to go to the Peak District and I’ll take it. But apart from a handful of other Sheffield students, this was going to be two days and night with a bunch of people I had never met before, all of whom would surely be far more clued up than myself. I had a good few hours at the bunkhouse waiting for everyone else coming further afield to arrive - more than ample time to fully convince myself I would spend the whole weekend in a state of embarrassment from not knowing enough facts about climate change! Since joining University I had been keen to make some sort of a positive difference, but in all honesty had no idea where to even start. This session lead by Anna Lewis, Students for Global Health’s Policy and Advocacy Director at the time made me realise with a clear framework of goals and actions, successful campaigns can be led by any of us given the will. Following the break was arguably my favourite section of the whole weekend – Showcasing Sheffield*. Here we had Aaron Thierry from Sheffield Climate Alliance to talk about the incredible successes that his organisation has had in pushing to reduce the city’s carbon footprint, using this as a springboard to run a workshop on how to communicate what we know about climate change to others. Sheffield Foodhall Project followed next discussing their efforts to reduce food waste by bringing communities together to share meals in an open and welcoming space. And this was just the very start of the weekend. Over the course of the two days we also had talks from WECAN’s director on Climate and Gender; We heard from UEA and UCL about their Schools Project, inspiring our branch Healthy Planet Sheffield to start our own; And of course, belly dancing (that essential component of any self-respecting weekend away!). We rounded off the weekend with our final session – Planning Healthy Planet for the year ahead. This was a motivating and productive session where we established collectively the primary vision of our national network which has shaped our actions since it’s conception – To live in fair and sustainable communities which take collective responsibility for the unified health and well-being of people and our planet. Before I knew it, we were packing away and getting ready to go back to each of our universities – but now with a new energy and amazing contacts to help keep us working towards the vision we had created. As passionate as I had been before this point, I couldn’t deny that I was becoming worn out, feeling that no one really actually cared about how our changing climate is going to affect the health of large communities now and in the future. Being immersed for just two days with encouraging people who felt equally passionate was exactly what I needed to set up for the year ahead. But if you’re going to take anything away from this blog post here’s the bottom line – save the date for the 30th March. I hope you’ll find a highlight for 2019 too! ​ Sheffield and a big fan of this city I hope I’m allowed to be biased! Amy McIntosh is Health Planet UK's National Committee Lead. ​To round off 2018 and jump into 2019, Amy McIntosh, Healthy Planet UK’s National Committee Lead, chats about highlights from across the network from the past year and ways you can get involved in 2019. The year kicked off with the National Training Weekend in February in the Peak District. We spent two days forging new friendships, equipping ourselves with new knowledge about climate change & health, belly dancing, goal-setting, project mind-mapping, debating, vegan-cake eating and blizzard-trekking! Creating a fresh vision together has given us new heights to aim for, steering the rest of the activity for the upcoming year. But did we make it closer to living in fair and sustainable communities, which take collective responsibility for the unified health and wellbeing of people and our planet? We are one step closer to seeing a greater number of communities living this way due to exponential growth of branches this year – we got to celebrate the launch of new Healthy Planets in Sheffield, Bristol & Cambridge! All these branches are already having huge impact encouraging their cities and universities to understand the importance of the protecting the climate to improve health. From medical students, to GP practices, to school children, these branches are making strides to encourage everyone to take responsibility for living in a healthy planet. Working with our affiliate organisation, Students for Global Health (SfGH), we passed not one, but two policies at their spring general assembly! This means SfGH now has the mandate to advocate, educate and take action to reduce air pollution. They will also continue to take steps to make sure that their money is not funding the fossil fuel industry – key to making sure we prevent runaway climate change. Exciting new ties were also forged with Sustainable Healthcare Education, partnering to improve sustainability teaching in medical schools. And not forgetting the March for Climate Justice, which saw network members from across the country walk across London with hundreds of others to campaign for climate justice! We rounded off the year with a shiny new national committee in newly polished roles – with positions that specifically focus on schools projects, sustainable education, policy and political action. Get to know them through our new Instagram account – they’re a great bunch and would love to hear from you! The national committee exists to support the branches in all the groundwork they do. Don’t hesitate to get in touch with any of the national committee if you would like to get involved in the areas they are focussing on through healthyplanet@studentsforglobalhealth.org. Like any year, 2018 was not without its hitches and hard work and we’ve still got a long way to go to reach our vision! This includes improving the national committee structure, with better clarity about each role and improved coordination to ensure that it serves branches as best as it can, providing more opportunities for members to get involved in national projects. Gaps remain in national committee as affiliates coordinator and treasurer, two essential roles to continue our partnership with SfGH and improve funding. We hope that this year will bring about more resources for those wanting to start school’s projects and set up branches. An urgent update of our constitution will give better clarity for those new to Healthy Planet. This year we will resurrect our historical efforts to campaign for health organisations to divest from fossil fuels, with a new partnership with Medact. Much work is still needed to ensure that the SfGH policies are put into action and used. The recent IPCC report gives us even more motivation to act fast and efficiently to complete all these so that everyone can enjoy a healthy environment! What will your 2019 Healthy Planet year look like? Do you care about climate change and health, but feeling alone or demotivated? Come along to our national training weekend in Spring to meet like-minded individuals and get inspired (date & location TBC). Do you want to make a difference in your university? Get involved with your local branch, or even start a new one! Are you looking for new skills in policy and political campaigning? Get in touch with Izzy, policy lead, to push for fossil free investments in healthcare. There are so many ways to play your part in working towards a healthier planet – don’t hesitate and start your year off right! Even amongst the small and highly-biased sample of the world's 7bn+ population likely to read the average Healthy Planet blog, I'd guess that few see themselves as the next HP coordinator. I say this because few of the past HP coordinators I've known saw themselves in that role until, for one reason or another, they ended up occupying it. I certainly couldn't envision it. I've never had the silver tongue or inspiring manner of a feted leader, not even the logistical nous of a good organiser; but, as it turns out, that doesn't really matter. All that really counts for being a great HP coordinator is a passion for fighting for a healthier, fairer future for the environment and humans whose lives depend upon it. In large part, that's because you'll never be alone or unsupported. HP works with an amazing circle of academic and activist collaborators like Medsin, the IFMSA, Medact, and People and Planet; and through our work with the Centre for Sustainable Healthcare, Climate and Health Council and Sustainable Healthcare Education Network we have access to an impressive network of more experienced academics and clinicians with a wealth of knowledge (and plenty of letters after their names when you need to impress some people in suits). Not to mention our greatest resource - the Healthy Planet network itself. As a coordinator, you'll be able to work with the networks to decide priorities for education, advocacy and action on climate and health, and work out how best to utilise the voices and abilities of young people to fight for environmental and climate justice. For me, in the year or so running up to the high-profile UN climate negotations at COP21 in Paris, that meant: ramping up our fossil fuel divestment campaigning to ensure the world heard that the business practices of the fossil fuel industry were incompatible with a healthy climate; acting locally on homegrown environmental justice crises like air pollution and fracking; and continuing our work on climate and health in medical education in partnership with Medsin and the Sustainable Healthcare Education Network. Healthcare students can provide a unique perspective on the issues that will define the practice of tomorrow's health workers, and people will call upon HP coordinators to give voice to that perspective - it's taken us to global health and medical education conferences from Glasgow to Barcelona, seen us published in general media like the Guardian and specialist journals like the BMJ, even taken some of us (though alas not me personally, finals getting in the way as they do) to the COP21 talks in Paris. There are, of course, some tough bits to the role. Activist burnout is always going to be an issue for anyone trying to confront such an all-encompassing structural injustice as climate change, and self-care will play a central role in handover to our successors. Managing a geographically-distributed network with international partnerships can be tricky (if only for trying to timetable group calls across multiple timezones); here the face-to-face contact opportunities provided by our training weekend and conferences run by our Medsin and Medact allies are invaluable in bringing the network together. And, as with most things in the UK, organising can sometimes seem a bit London-centric - but Ele and I have managed from our bases in Sheffield and Edinburgh respectively, and HP at least focuses well beyond the capital, hosting events from Norwich to Aberdeen. We hope that our successors will be able to make HP a stronger, more unified and tight-knit group, even better able to educate, advocate and act for a fairer, healthier planet. We know you're up to the job - even if you don't yet. I first started getting involved with climate activism around 2 and a half years ago, after becoming increasingly aware of the crisis we are heading into, and have already began to experience. Since then, things have gotten even worse. As predicted. However, I think the movement that has risen to confront it has got stronger, and being a part of this as Healthy Planet co-ordinator has helped me out of a pretty hard period of depression, and given me hope to keep fighting for a more just world. From leading fossil free health workshops in Barcelona, to occupying a university building for ten days over their fossil fuel investments, the last 2 years have been pretty incredible. Being part of Healthy Planet has given me so many opportunities to meet other healthcare students interested in this, teach others about climate+health impacts and attend global climate conferences to either take part in the policy making, or protest the policies! It's also helped me when I struggle to find the meaning in memorizing hundreds of drug names and anatomy, as I'm motivated by the importance healthcare professionals have in tackling climate change and social injustice. We need to learn from history. We need to listen to those at the front lines of colonial fossil fuel extraction projects. We need to speak out for people's right to clean water, clean air and land to grow food. I still find myself listening to people speaking about climate change as if it's this distant event that hasn't affected us yet, therefore it's not our problem. When everyday, fossil fuel companies are carrying out increasingly violent extraction projects; evicting indigenous peoples off their land, poisoning water supplies and grazing land, oil spills polluting whole generations of marine life. This is what is fueling the climate crisis, and this is what we can do something about now. Amplifying people's stories and supporting their struggles is so vital. I'm still learning so much about how to be a genuine ally, but the process so far has been profoundly meaningful. Being stuck in a room with 20-50 other people for 10 days as part of an occupation for fossil fuel divestment was intense, but it also built some beautiful friendships that have created an essential support network for continuing our climate and social justice activism. 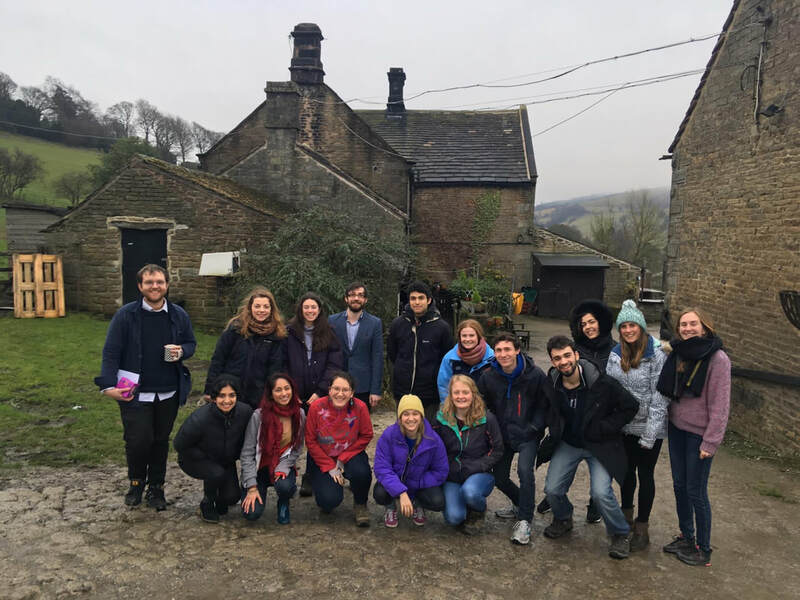 So has being part of the Healthy Planet network - I've met some of the most inspiring people in my life through this network of healthcare professionals and students from around the UK and globally who are just as passionate about climate + health issues. Being an activist can be exhausting, the world is pretty f**ed up when you start to dig deep into the causes of injustice, and having people who get it, to share frustrations, take much needed breaks and laugh when everything gets too much is invaluable. Our ecosystem is in a state, but there are many other social injustices that are contributing to its further deterioration, and by challenging them I think the future doesn't look as bleak. Climate change is impacting those most vulnerable - that is those that are already being oppressed by our neoliberal capitalist system. In order to make climate change less devastating, our communities need to be embedded in social justice - that is challenging the oppressions of racism, sexism, fascism, classism, homophobia etc, that is further exacerbating inequalities and fuelling conflict, violence and suffering. Working on climate change intersectionally - through exposing the racism and classism of environmental pollution, the gender inequalities of those most impacted by climate change, has built a stronger movement that aims to leave no-one behind. I look forward to supporting the new Healthy Planet national committee, and am excited about what we can achieve over the next year! World leaders have been gathered in Paris from 1st-12th December to construct a global agreement on climate change. There has been a long build up to this, and much expectation. On December the 12th, the Paris agreement was officially adopted. ​So what's in the agreement? The agreement aims to pursue emission reductions from 2020 that would be in line with limiting temperature rise to 1.5 degrees. Civil society groups have been campaigning hard to get 1.5 degrees in the text. For many countries, such as the Marshall Islands in the Pacific and Bangladesh, any rise above 1.5 degrees could see their communities completely submerged by sea level rise. However, the text falls desperately short of recognising and revering the lives of these communities considering the lack of mechanism or strategy to achieve a target well below 2 degrees. Countries have only committed to voluntary declarations of carbon emission reductions outlined in their INDCs (individual countries plans for decarbonisation). Considering the commitments of the INDC’s add up to a 2.7-3.5 degree of warming, this is really not good enough. James Henson, the famous NASA scientist, who has been deemed as an important kickstarter of the UN climate negotiations, said “It’s just b******t for them to say: ‘We’ll have a 2C warming target and then try to do a little better every five years.’ It’s just worthless words. There is no action, just promises.” This is based on the method in which these emission reductions are set to be monitored, through “facilitative, non-intrusive and non-punitive” follow up every 5 years from 2023. Considering the immense lobbying power of the fossil fuel industry, and the world organisations that are profiting from fossil fuel infrastructure over renewables, the incentive to decarbonise based on voluntary commitments is slim. “As long as fossil fuels appear to be the cheapest fuels out there, they will be continued to be burned.” continues James Henson. What have the health community been up to? The health community had a much more prominent platform at COP21 then they ever have, with the genesis of the Global Climate and Health Alliance, working alongside the WHO, IFMSA, HEAL, and others creating significant avenues for the health community to take action and provide essential mitigation and adaptation strategies that will also provide solutions to current public health crisis. The 5th December saw an alliance representing 1700 health organisations, 8200 hospitals and health facilities and 13 million health professionals bringing a global medical consensus to action on climate change. They gave the damning evidence that failure to act on climate change would lead to a reversal of the last 50 years of gains in public health. This outlines the importance of the health community to be at the forefront of climate resilience, adaptation and mitigation, as well as taking the lead in ensuring health systems are able to withstand the impacts of climate change. There was also an event put together in coalition with the Lancet, The Rockefeller foundation and Wellcome Trust which gave an overview of “Healthy Lives on a Healthy Planet” and saw the presentation of a wealth of research that provides a substantial platform to build stronger and effective policy on climate change and health. It is clear that we need to be taking the lead on the benefits of kicking our societal addiction to fossil fuels and recreating an economic, social and political system that provides the health benefits we so urgently need. ​The work of the health community at COP21 only signals the beginning, with the challenge now being to turn these declarations into action, and creating tangible and visible climate and health action in our communities. So whilst politicians from these 195 countries tried to sort out a deal inside the walls of the summit, it was the people outside of the two-week long summit, in the streets of Paris, who were the loudest voices. 'D12', held on the 12th of December, the final day of COP21, Healthy Planet joined Medact, the Global Climate and Health and Climate Alliance and more than 15,000 people from across the world in gathering between l'arc de Triomphe and the Eiffel Tower to represent the voice of the communities most affected by our changing climate. ​The tragic terrorist attacks which occurred near Place de la Republique in Paris last week meant the French government had understandably declared a state of emergency in Paris. However, COP has never just been about what goes on inside the conference, and due to the lack of accessibility of civil society and the global climate movement to make their voices heard inside the conference, millions had intended to take to the streets during the last day of talks. This seemed even more pertinent after the terrorist attacks, given the interconnections of climate change with conflict, migration and the need to build a future away from oil driven war and towards climate justice. Many see the the new climate deal as an essential step in peace-building, and thus the demonstration on Saturday were finally approved by the government to go ahead. Although the original more radical plans for civil disobedience were overted, we still joined over 15,000 people on the streets in an act of defiance and a signal for system change not climate change, holding up long red banners symbolising the red lines that COP’s inaction on climate change had already crossed. We also attended an action led by indigenous peoples as part of the Indigenous Environmental Network who held a healing ceremony in the morning, lifting up the voices of their communities - whose bodies are already red lines that have been crossed. Every time someone gets displaced, is poisoned near an extraction site, loses access to their land and water, has fracking imposed on their community, and experiences the dismissal of Indigenous voices and struggles, our Red Lines are crossed. For many keeping fossil fuels in the ground is a decision of life and death.“It's worth pausing to know this: we do negotiate the right of entire countries to exist” says Naomi Klein, environmental journalist and author. The science is clear that if we have any chance of staying below 2 degrees we need to leave 80-90% of current fossil fuels held in fossil fuel companies reserves underground. However,‘Fossil fuels’, ‘oil’, ‘gas’ or ‘coal’ are not even mentioned in the agreement. All countries have to do is be transparent about their country's actions in reducing emissions - it really is now up to us to organise, mobilise and take action to keep fossil fuels in the ground! 2016 holds many exciting plans for Healthy Planet and our allies in the climate and health movement. Starting with Go Green Week from the 8th-13th February, where Healthy Planet will be working with fossil free groups from around the UK to draw our red lines - calling out health institutions ties with the fossil fuel industry and the health impact this has on communities around the world, and on their doorstep. To start preparing download an action pack here. This will then lead into a weekend of community building, skill sharing and strategizing at the Healthy Planet training weekend taking place in the Peak District on 5-6th March. Join the event page for more details here. We will be continuing to pressurise health institutions to take the lead with divestment, as well as building resilience and mitigation strategies for decarbonisation in our communities, ensuring that health is at the heart of climate action and used as a motivator for a just transition towards a fossil free future. “Time will reveal the true nature of the Paris Agreement. From epic turning point, to naïve expression of hope, it is the real-world actions that follow that will decide,” said Professor Chris Rapley, a leading climate scientist from University College London. 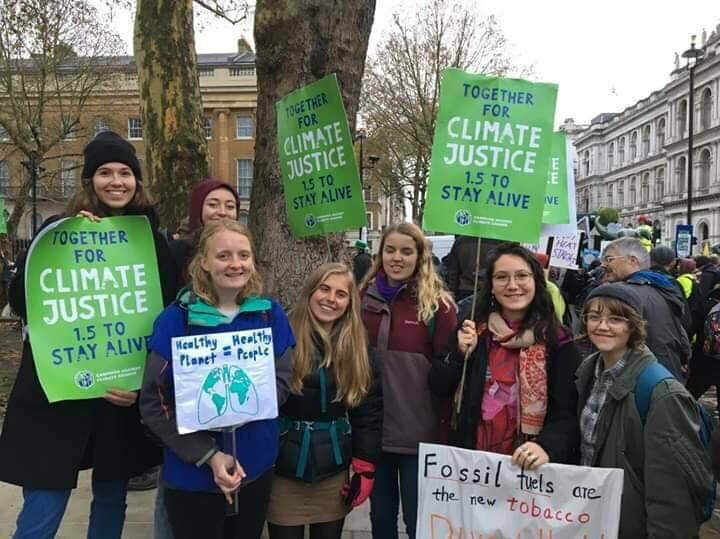 This post was written by Tahmina Parveen of UEA Healthy Planet following their university debate on fossil fuel divestment, organised by the Healthy Planet Branch last month. Find out more about UEA Healthy Planet and get involved at their Facebook and Twitter pages. 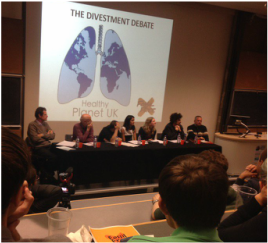 UEA Healthy Planet hosted a debate putting forward arguments from six panelists from different backgrounds, proposing answers to the question: ‘Should UEA cut ties with the fossil fuel industry’ on the 22nd October. The rationale behind this debate is because UEA is well known for its research in climate change, however this institution has over £130,000 invested in fossil fuel companies, including Shell and BG group. Dr. David Pencheon, the Director of the NHS Sustainable Development Unit, proposes that unless health systems and universities show big symbolic signs that something is ethically, health-wise and financially undesirable, we will be perpetuating it. Chris Jarvis, UEA Student Union’s Campaigns and Democracy Officer, reiterates Dr Pencheon’s perspective, claiming that divestment represents a more profound and symbolic change. He outlines that it is hypocritical for an institution that wants to continue its reputation as progressive, to exacerbate the worst aspects of climate change by investing in the fossil fuel industry. Emma Silk, UEA Environmental Sciences graduate and former Fossil Free campaigner, emphasised a point of hypocrisy. As an institution that is one of the leaders in climate change and environmental sciences research, how can UEA fund the industry that is doing the most damage? Furthermore, UEA has justified its inaction by stating that their investment are made into “sustainable and ethically appropriate funds,” however, these companies are notorious for their disregard of human rights and environmental abuse. Brett Scott, a financial activist questions the “risk and return” ideology of traditional finance. He argues that high returns do not justify the “undermining of ecological stability and humankind.” Historically, protests have been shown to be effective in forcing the industries to change, it is a resource that we must exploit in order to build a progressive society. UEA economics lecturer, Dr Fabio Arico pushed his pro-divestment view in which he stated that the most important role of this institution is to improve education and innovation. He believes that the university is unable to afford the cost of divestment and that students and UEA as a whole would be better off looking at a different take on being environmentally friendly. Prof. Andrew Watkinson, UEA Environmental Sciences lecturer and former director of the Tyndall Centre highlights that UEA very much supports climate change research, whereas current UK politics has sidelined climate change as a global issue, perhaps suggesting that UEA is already doing so much for climate change, thus does not need to do anymore? Members of the audience commented that £130,000 is not a lot of money, and that we should be focusing our efforts elsewhere, where we could make a bigger impact. Our current profit-driven fossil-fuelled energy system is a killer. Climate change is leading to untold suffering, devastation and death across the world. Closer to home, this energy system is harming people too - the most drafty housing stock in Europe, combined with unaffordable energy prices, leaves millions of people in the UK shivering throughout the winter. Along with being linked to detrimental impacts on mental health, there is a longstanding body of evidence to show that living in a cold, damp, drafty home leads to devastating effects on physical health, such as causing and worsening cardiovascular and respiratory disease, killing thousands of pensioners and other more vulnerable people every winter. The figures announced this November are expected to the highest in fifteen years- but these deaths are preventable. A drafty home is a home that requires more energy to heat, so The Big Six energy companies, who control over 90% of the market in the UK, have a huge vested interest in keeping them drafty and keeping energy bills high. In December 2013 British Gas lobbied hard for a £50 per household reduction in the ‘green levies’ which paid for free home insulation for the most fuel-poor households and supported renewable energy. This ‘reduction’ meant that they put their prices up by £83 rather than the £123 rise they had planned to implement in January 2014. The profits of their parent company Centrica stood at £1.58bn in 2013. 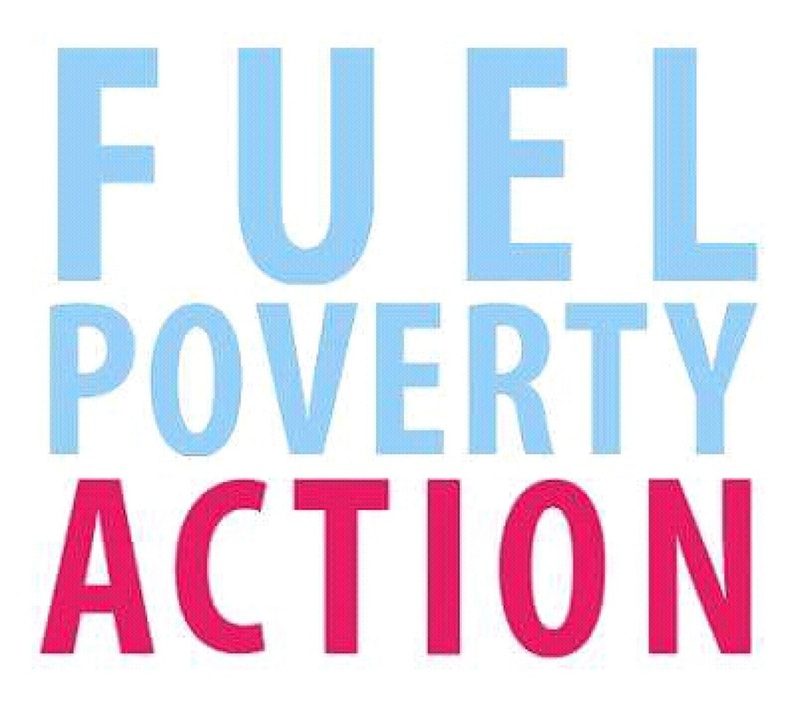 Fuel Poverty Action fights for an energy system that could be very different. FPA is a grassroots London-based campaign and support organisation that has been fighting for an energy system built on the premise of meeting people’s needs - insulating millions of homes for free, investing in renewable energy and breaking our addiction to fossil fuels. This will result in lower energy prices, warmer homes and reduced carbon emissions. The positive impact that such an energy system would have on our health is clear. FPA also supports people struggling with their bills in the here and now through advice and advocacy on energy debt. Fuel poverty is also a ‘bridge’ issue- between climate change, energy injustice and austerity. For many people, climate change comes a long way down the list of daily worries - worries about feeding the children, keeping the debt collector from the door, fighting sanctions from the job centre. We can’t expect people to automatically have any kind of emotional connection to the concept of climate change when it feels so remote compared to thing such as austerity policies, which are so brutally impacting the everyday. People know that the energy companies are not acting in their interests because they have to pay bills which are impoverishing. However, starting from this point makes it a lot easier to engage with people on issues of energy injustice. Over the last few years FPA has made important gains. We started out by building a diverse coalition of groups who now work and campaign together- from ESOL students and those campaigning for asylum rights and local energy co-ops, to housing and pensioner groups. It’s not often that protests are lead by pensioners, but ours are, and with that we are able to push back against the media narrative that pensioners are simply passive victims of fuel poverty and instead show they are some of the most active and serious campaigners on the issue. We have been successful in achieving widespread media attention. Whilst Jeremy Corbyn has pushed the issue of energy renationalisation up the political agenda in the last month, we have spent years challenging the current energy system and suggesting publicly owned energy in dozens of mainstream media appearances on TV and in national newspapers, keeping the debates on energy ownership alive. We have had big successes supporting individuals in energy debt and have delivered training so that people are empowered to resolve their own situation with their energy provider. If you are interested in getting involved with Fuel Poverty Action there are a few areas we need support with, such as research (there are dozens of reports on energy democracy to fuel poverty), helping us to promote and distribute our ‘In trouble with your energy company? Know Your Rights’ cards and guides to community groups, becoming a ‘Know Your Rights’ trainer, getting involved in organising the action against deaths from fuel poverty at the end of November, translating our Know Your Rights resources and much more! As part of our climate change and health education work, Healthy Planet is part of the Sustainable Healthcare Education Network - a group of healthcare professionals and educators working to empower healthcare students to address climate change and sustainability in their working environments through sustainable healthcare education. The following is a guest post from the Network coordinators. Are you concerned about climate change or the environmental footprint of our health service? Do you know what health professionals can do in their professional lives to address these issues?Do you think that your medical curriculum could teach you more about these topics? The Sustainable Healthcare Education network needs your help! We are developing networks of students and staff in medical schools across the UK. Since 2009, we have developed and implemented teaching materials about health and the environment for medical students, carried out a national consultation on learning objectives for UK medical students and run workshops and training for educators across the UK. We are looking for a student representative and student network members. Get in touch if you think this could be you! There is also an opportunity in September for five medical schools to join a programme to support the development of a Sustainable Healthcare Education team and new teaching. Any medical school that would like to attend must send at least one student and one staff representative and commit to follow up work (such as providing a teaching session, evaluating new teaching and engaging with the national network) during the academic year 2015-2016. If you would like your medical school to be involved, contact frances.mortimer@sustainablehealthcare.org to see if there are already staff reps at your school. The 1st June marks the beginning of 2 weeks of UNFCCC negotiations held in Bonn, where Healthy Planet will be part of the IFMSA delegation focusing on ADP2.9 (Ad Hoc working group on the Durban Platform for Enhanced Action). Success in COP20 in Lima and ADP 2.8 means that health co-benefits now feature in the draft text, however, with a lot of cuts expected to be made in order to construct an appropriate text for Paris, there is still a lot of work in ensuring health remains a priority. What is the Ad Hoc Working Group on the Durban Platform for Enhanced Action….? The ADP was set up at COP17 in Durban in 2011. It’s main mandate is to construct a protocol with legal force by 2015 which will be implemented by 2020. It is split into 2 main areas - workstream 1 and workstream 2. Workstream 1 is concerned with the architecture of the 2020 agreement - considering factors such as the legally binding nature and how emissions will be measured, reviewed and verified (MRVs). Workstream 2 looks at how to close the emissions gap, which is the current gap between scientific targets and countries emission reduction commitments (which is worryingly large!) Mitigation targets are currently defined using some more lovely acronyms - NAMA and MRV - with NAMA standing for Nationally Appropriate Mitigation Actions, which are emissions targets for developing countries and MRV for Measurable Reportable and Verifiable targets to ensure greater accountability for the higher emitters in the developed world. The IFMSA delegation will be working with other organizations dealing with health and climate change including the WHO, YOUNGO and Healthcare without Harm to reinforce the message that climate change is both a health emergency and a tremendous opportunity to improve population health. We will be promoting our policy brief which outlines the main areas in the ADP text in which health impacts and health co-benefits should be reinforced. With the World Health Assembly passing a resolution to cut fossil fuel use due to the public health impacts of air pollution, China rapidly transitioning to renewables due to devastating health impacts of air pollution and Barack Obama putting public health at the core of his climate change message in April, there is reason to hope that climate and health will feature more prominently than ever in the upcoming weeks in Bonn and continue building momentum in the lead up to Paris and beyond. Fossil fuels - the new tobacco? 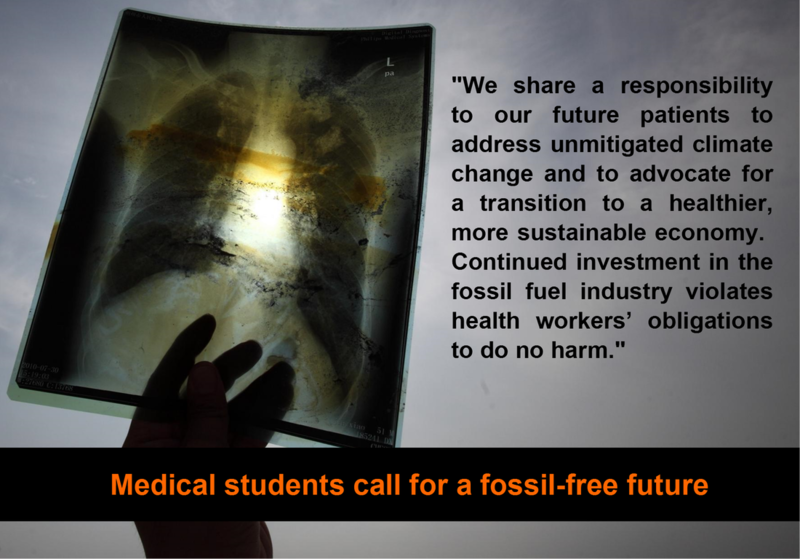 This morning the Guardian newspaper published an open letter from medical students worldwide calling on the health sector, in particular the Wellcome Trust and Bill and Melinda Gates Foundation, to divest from the fossil fuel industry. It's no surprise that we're signatories; but we're small fry compared to the others - the International Federation of Medical Students' Associations (IFMSA), the Australian Medical Students' Association (AMSA), the Canadian Federation of Medical Students Global Health Programme, Medsin, and Doctors for the Environment Australia﻿﻿, to name a few. You can read the full text of the letter (with references) on our website, and further Guardian coverage here. The letter comes on the back of the publication of our Unhealthy Investments report outlining the medical, moral, and financial case for divestment, and the Guardian's own 'Keep it in the Ground' campaign, launched last month. The Guardian petition inviting Wellcome and the Gates Foundation to divest has already attracted well over 180,000 signatures, and has provoked major debate within health circles and beyond, including two articles by Wellcome director Jeremy Farrar outlining the Trust's position (you can find our response here).